St Peter’s Basilica alongside the Colosseum is one of Rome’s most impressive and famous buildings. It seats 60,000 people and with 15,000 square metres of floor space is the second largest church in the world. The domed building is the largest self-supporting brick structure of its kind in the world. One can reach the dome via stairs and from there one has a wonderful view over the city. Originally St. Peter’s Church (this is the correct name) was intended as a grave for the apostle Petru; built at the site where Emperor Caligula had him crucified. The first Basilica was erected by the first Christian ruler of Rome – Emperor Constantine at the end of the 3rd Century AD, and stood for approximately 1,200 years. 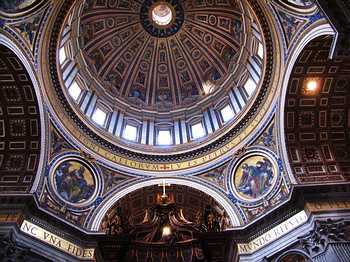 As the structure gradually deteriorated, Pope Julius II decided on a new build – the present day St Peter’s Basilica. Even in this Church the tomb of St Peter stands as a central feature. Famous renaissance artists like Michelangelo were involved in the construction of the building. Over the grave of St. Peter stands the cathedral’s main altar. Around it are arranged five national chapels. Right next to St Peter’s grave is a crypt in which the tombs of 23 popes can be found. In the north-western part of the cathedral stands the statue of St. Peter which is still revered by the faithful. The basilica is the largest sanctuary of the Roman Catholic Church. Here the Pope regularly reads Mass. Directly in front of the Basilica is the oval-shaped Peter’s Square. It covers an area of 340m x 240m and was designed by the great Italian artist Gian Lorenzo Bernini. It was built after the completion of the Basilica in the years 1657-1665 and serves as a gathering place for believers. On major religious holidays this huge space is filled with thousands of pilgrims from all over the world. Its architectural design brings out the beauty of the Basilica . Both colonnades along the sides are adorned with a total of 140 statues of saints. The obelisk in the centre stood there even before the establishment of the square. 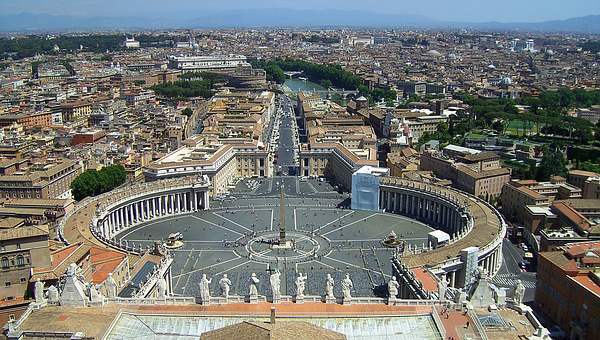 The symmetrical appearance of St Peter’s square is completed by the two fountains located there. 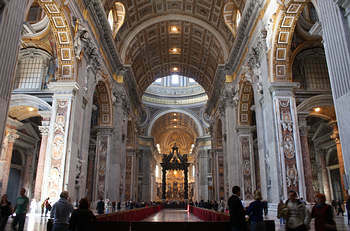 Both the Basilica and St. Peter’s square are easily accessible using public transport. One takes e.g. the metro- line A to the stop ‘Ottaviano’ or one can use the bus routes 40 and 81 – bus stop St. Pietro.